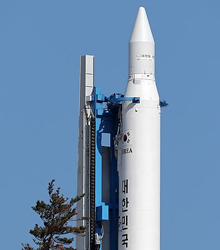 South Korea is counting down to the third launch attempt of its NARO rocket, a two stage vehicle comprised of a Russian built liquid fueled first stage and a domestically produced solid second stage. The rocket, which was originally designated KSLV-1, is named for the Korean Space Center on Outer Naro Island, 300 miles south of Seoul, from which it will be launched. This will be the third launch attempt for the rocket. The first flight, on August 25, 2009 failed when a portion of the payload fairing stayed attached to the rocket, causing it to fall short of reaching orbit. The second launch, on June 10, 2010, broke off contact 137 seconds into the launch, and was presumed to have exploded. The investigation of the mishap became contentious when Russian and Korean members of the evenly split 26 person review board, each pinned blamed on the other nation’s components. There are a couple of interesting points concerning the rocket. The Russian first stage is powered by a RD-151 engine, which is an intentionally derated version of the single chamber RD-191 engine. This engine, derives from the much larger 4 chamber RD-170 designed to power the liquid fueled boosters for the Soviet Energia heavy lift booster, which have in turn become the first stage of the Ukraine built Zenit and the ILS-Sea Launch. As if that were not enough, the other member of this expansive engine family is the RD-180, the two chamber engine which powers the U.S. Atlas V.
Regardless of the outcome of this launch, the technology sharing Russian / Korean partnership which produced the NARO will go its separate ways. Although development has been at a slow pace, Russia intends to use the first stage (with the more powerful RD-191) as the core Universal Rocket Module component of its proposed modular Angara rocket family. With a kerosene/ lox first stage and either a hypergolic or kerosene / oxygen second stage, the Angara would offer a complete range of lift solutions, from a small single core all the way to much larger version intended to replace the Proton. For what it is worth, which is probably not much, the universal Rocket Module has also been proposed as the basis for the Baikal, a re-usable flyback booster, which would feature both a folded wing which rotated into position following thrust termination, as well as a single jet engine to allow for a powered runway landing. A mockup was placed on display at the Paris Air Show in 2001, but little if any progress has taken place since then. Korea for its part, intends to proceed to a fully domestic, three stage liquid fueled launch vehicle, the KSLV-2, planned to debut after 2021. The Korea Aerospace Research institute (KARI) is responsible for the project and has stated its desire to offer the vehicle on the commercial launch market, but with only a small payload capacity (1.5 tons) which limits the available market, and rapid evolution in the United States it seems unlikely that the Korean entry would be competitive, particularly against the SpaceX / Stratolaunch combination. Korea is further constrained by geography, as low inclination launches would fly directly over Japan, which might present an issue in the event of a failure. The only clear flight path is almost due south, skirting Japanese territory but over mostly open sea. The launch is currently scheduled for 3:30 PM local, 2:30 AM Eastern on Friday.